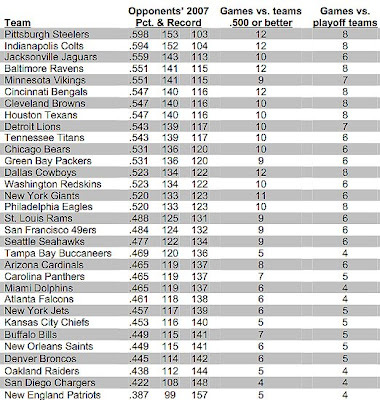 NFL Strength of Schedule 2008 - Fantasy Football, Fantasy Football Rankings | Mac Bros. The Pittsburgh Steelers and Indianapolis Colts have the NFL's most difficult 2008 schedules. Conversely, The New England Patriots and San Diego Chargers have drawn the easiest schedules. Here now, is a quick snapshot at this 2008 Strength of Schedule. Click on it to enlarge.